1.Hooks that do not bend or kink ,cast using high quality materials. 2.Crochet Hook Needles Kits get everything you need to Crochet your perfect pattern. 3.Offers you all the different hook sizes you will ever need. 4.Easy to carry,organize all your hooks and accessories in one place. 5.Fantastic gift for anyone who is interested in arts and crafts. Whether they are new to crochet, or an experienced crocheter. With the ergonomic handle design, you can crochet the day away with ease and extreme comfort. 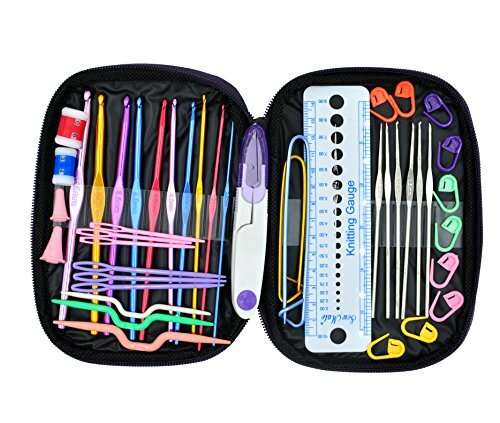 Perfect crochet hook sets with a case which is a convenient to carry. All the parts will be put in the case by random, so maybe the color of the tools will be different each time. This is not toys for children, so please keep it away from your babies. VALUE PACKAGE--The crochet kit contains 49 pieces of tools. Save your space, mark a stitch, measure a length- this set has everything you need. SAFETY HOOKS--The hooks are smooth and symmetrical which means no more snagging or tearing your yarn while you knit. Every hooks printed with size, you know which you need. WHATS IN THE KIT? Each kit contains 10 Aluminum Hooks 12 Silver Hooks, 2 Aluminium Stich Holders, 1 Stitch Measure Needle Gauge Ruler, 2 Stitch Counters, and 2 sets of Needle Point Covers to keep the points from making holes in your work. See the follow package details. PERFECT CHRISTMAS GIFTS--Convenient compact and easy to organize. Craft lover need more crochet hooks, they will be overjoyed at this set which will increase their supplies and come in handy everytime! WHAT YOU GET--22 pcs crochet hooks with 27 accesories, OldShark Welcome Guide and a package with OldShark LOGO. If purchase from fake seller, please contact us and report. We offer a worry-free 45-day money back guarantee, an 18-month warranty, and lifetime and friendly customer service. If you have any questions about this product by Old Shark, contact us by completing and submitting the form below. If you are looking for a specif part number, please include it with your message.